If any building needs its own Google Map, it's the engineering quad. While brainstorming for ideas over our first PennApps dinner, we heard at least 5 people complaining about the difficulty of finding places in the engineering quad. Then we realized: getting lost in the engineering quad applies even to graduating Penn seniors. 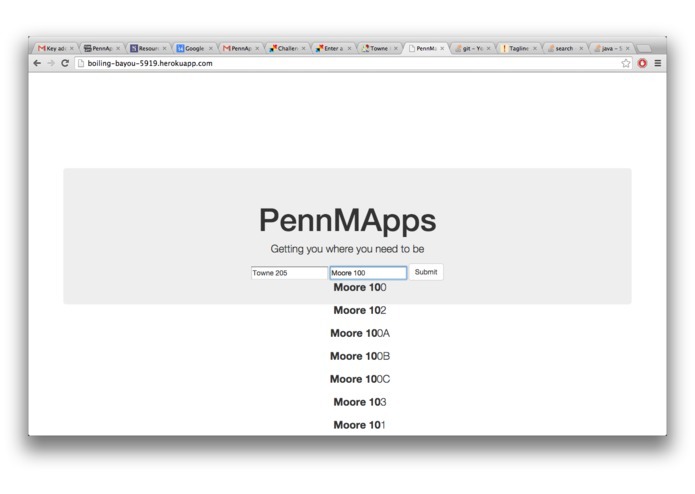 Thus, we present to you... PennMapps! A solution for navigating through the engineering quad using a shortest path algorithm. Simply input your position and where you need to be, and the app will give you a list of step-by-step instructions so easy to follow even your visiting grandmother can't possibly get lost. This app can be useful not only for Penn freshmen, but for any Penn student, visitor, professor, janitor, and especially help future PennApps participants and organizers save hours of valuable time. You'll be amazed at the paths you discover, as testified by the people who spent the night mapping out the buildings and still got surprised by the their own app's solutions.